Staff members demonstrate the Hear Here Alabama mobile clinic. Down the road comes the Hear Here Alabama mobile audiology clinic. Stocked with equipment and staffed with eager undergrads and professionals, the clinic heads out several times a year from UA to health fairs, county health departments and other places in West and South Alabama to offer hearing screenings and do research in areas where audiology resources are limited. 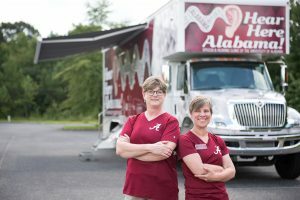 Now The College of Arts and Sciences is asking the public to help expand the mobile clinic’s mission and reach as part of Bama Blitz, UA’s online fundraising event for alumni, faculty, staff, students and friends. The Hear Here Alabama program is a “passion project” to which Bama Blitz contributors may give directly. Bama Blitz will run from noon on April 10 to 8:31 p.m. on April 11. So Hay-McCutcheon got the idea for the Hear Here Alabama mobile clinic. The program started in 2013 with $433,000 from UA’s College of Arts and Sciences, the Office of Research and Economic Development, Academic Affairs and the Center for Economic Development — money earmarked for buying equipment. Loaded with expensive instruments, the clinic represents a key research tool for Hay-McCutcheon. She and her colleagues have produced papers on hearing and memory, rural populations and social isolation for such publications as the International Journal of Audiology and the Journal of Clinical Psychology. Dr. Marcia Hay-McCutcheon, right, with Hear Here Alabama mobile hearing clinic. To the left is JoAnne Payne. Hay-McCutcheon, audiologist JoAnne Payne and a team of undergrads in the communicative disorders department head out both to offer hearing screenings and, if the participants consent, gather additional data. Each trip costs about $1,000. McCullough joins Hay-McCutcheon in performing screenings in two booths in the quiet environment of the clinic as well as perform crowd control and keep the area tidy. 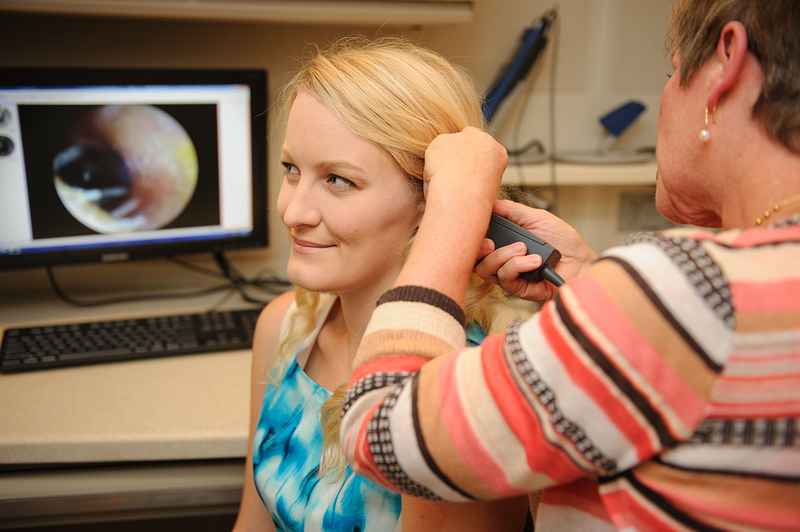 Visitors who fail the hearing tests are offered referrals or discounts to the clinic on the UA campus. Sometimes people getting the screening are in for a surprise. Because the mobile clinic has to go to an area and come back in a day, the range of locations it can visit is limited. Places the truck returns to often include Pine Hill, Demopolis, Livingston and Selma as well as events in Tuscaloosa. The College is asking for donations to allow the truck to visit each community at least once a month over a one-year period. Hay-McCutcheon also would like to expand into Pickens County.